Engineered to withstand severe weather conditions. 20’ by 80’ (1600 sq ft) shade area (approximately 100 head of cattle assuming 15 sq ft of shade required per head). Eliminates sprinkler usage – reduces the mud and mess caused by sprinklers in your lots. Cover is formed in an arc, allowing for easy rain runoff while maintaining adequate cover tension at all contact points (reduces wind whip, prolonging cover life). Easy one-time installation (with 2 people and common equipment expect only a 4-6 hour installation time). All components bolt together, no welding required. Holes are pre-drilled for easy assembly. All steel parts are galvanized to reduce corrosion and ensure long life. Cover is made of a durable vinyl and 70% mesh combination and reinforced with webbing throughout. The cover is permanently installed. Within minutes, and from the ground, the cover can be rolled out for use, or rolled up for winter storage. Duel cover tension system – cover is tensioned using webbing with 2” ratchets for superior tensile strength. The system breaks down into small and light-weight components for easy shipping. Tall 14’ work height (based on 4’ concrete pier height) allows for your machinery to work below the system without interference. 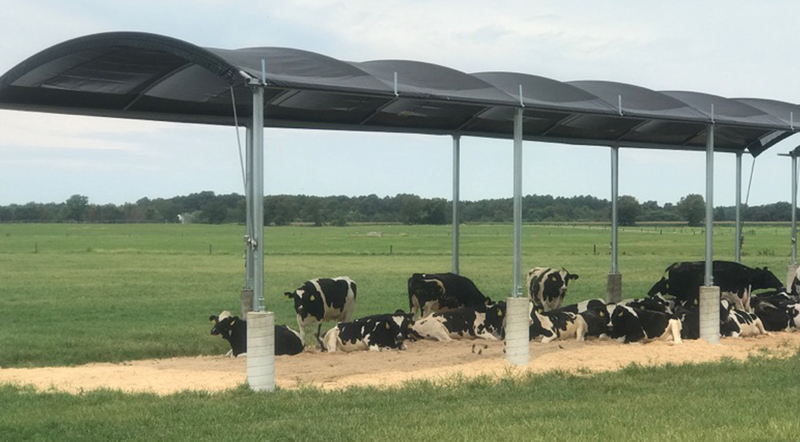 Best Value – Compare pricing and features, and you will see that the Rush-Co permanent livestock shade system is the superior choice. For more information about Rush-Co Livestock shading systems or a free estimate call 1-866-776-5617 or email us.